A Mock Evacuation of the Hall will be carried out during each season. Members are responsible for the safety of themselves and other club members. Falling: the result of tripping over, either upon approaching the hall or when participating internally with activities. Potential hazards include: electric cables, chairs and tables, greasy or wet floor surfaces. Collision: injury resulting from collision with a moving vehicle within or approaching the car park. Electrocution: resulting from faulty or misused equipment. Burns or Scalds: these are a particular hazard when working in the kitchen. Known Medical Conditions: any member suffering from a medical condition, which could result in sudden fainting, collapse or respiratory problems, should make their usual companion(s) aware of this, and, in confidence, inform a member of the committee. Fire: fire is the most serious hazard in the Redcliffe Hall. In addition to the main hall, there are the toilets, the kitchen, the storage cupboards and the room(s) on the lower ground floor where a fire could start. Response to a fire is documented below. A first aid cabinet is available in the kitchen. We would welcome anyone with first aid skills making themselves known to the committee. Instructions on how to evacuate through the emergency fire exit will be given at appropriate intervals during the year. 1. The discovery of fire should be notified to the membership and other people in the building, including the toilets and ground floor below. 2. A loud verbal demand will be made that everyone evacuates the building immediately by the nearest safe exit. Do not delay your exit by trying to retrieve personal belongings. The attendance register will only be retrieved if this can be achieved safely. 3. 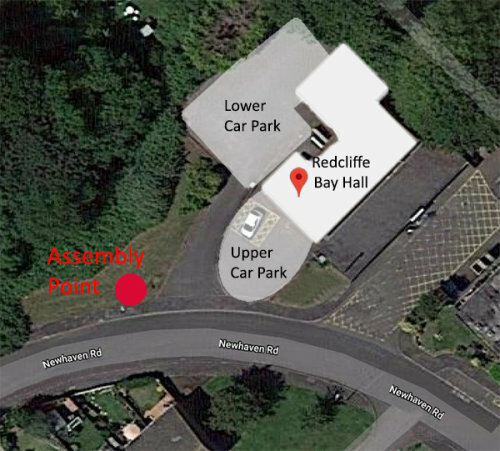 All are to assemble on the grassed area to the left of the entrance to the lower car park, where your presence will be recorded. 4. A committee member will, at the first available safe opportunity, notify the emergency services (Fire, Ambulance, Police) of the need for assistance. 5. Once the hall has been completely evacuated a decision will be made by committee members of the possibility of safely extinguishing the fire using available fire extinguishers and /or blanket. 6. No one should leave the site until their safe exit has been recorded.